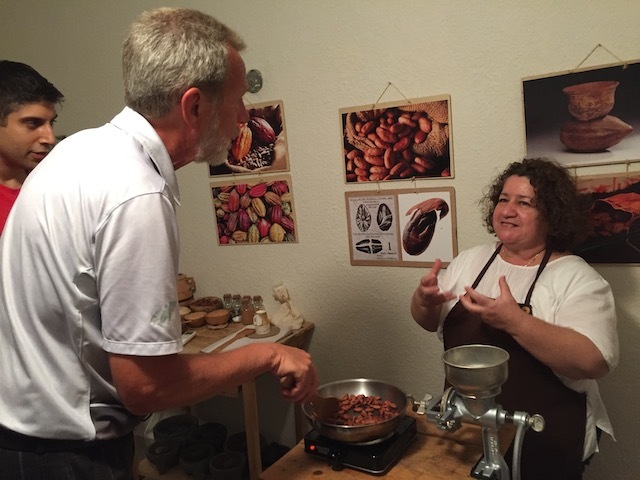 A Chocolate Evening With Beatriz | What Next? Getting to know Beatriz the mainstay of a family business called Fela Chocolate was the highlight for me of a chocolate workshop we participated in one of our last days in Merida, Mexico. 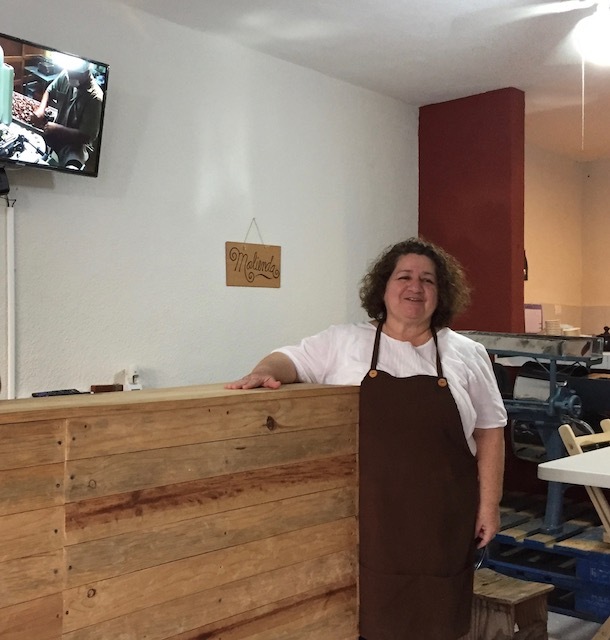 Beatriz is a highschool teacher, mother of three, grandmother of two and she runs chocolate making workshops for tourists. The business was the brainchild of her son who studies business and economics at a university in Idaho. 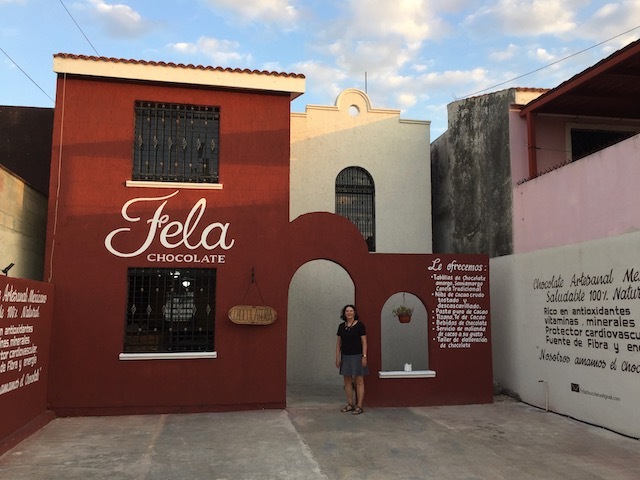 Her son’s fiancée, Lisbeth, who is an elementary school teacher, helps her future mother-in-law by welcoming guests to the Fela Chocolate establishment, a business that has only been in operation for about six months. 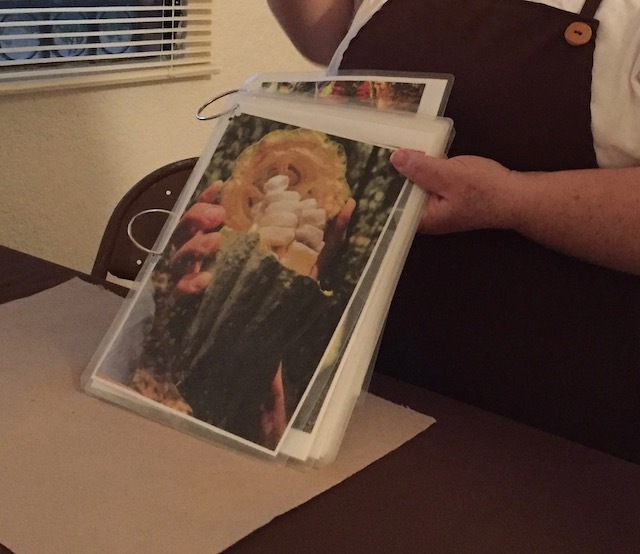 Lisbeth showed us pictures of Beatriz’s mother and grandmother. 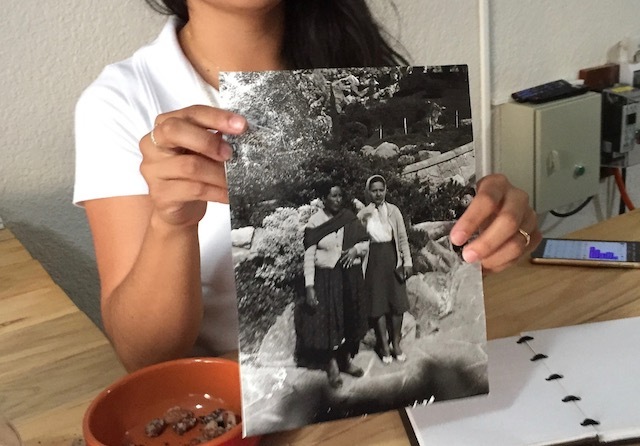 It was Beatriz’s grandmother Fela on the left in the photo who taught Beatriz how to make chocolate and the business is named in Grandmother Fela’s honor. 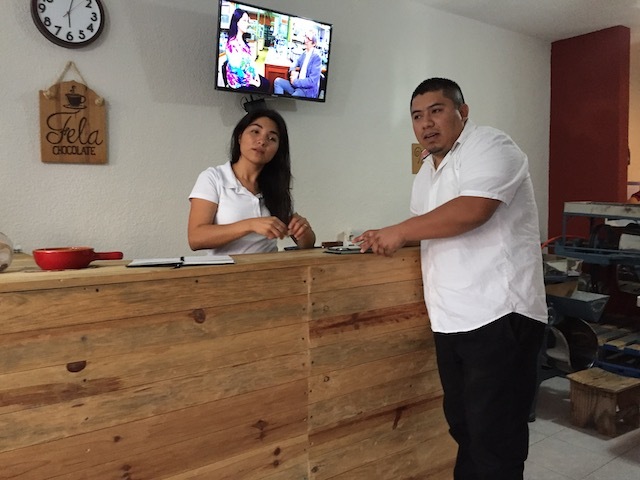 Neither Lisbeth or Beatriz spoke much English but Elias arrived soon after we did and told us he was an engineering student at a Merida university and would be providing the English translation for our tour. You could tell Beatrice was an experienced teacher because she led an excellent, interesting and informative workshop complete with numerous relevant visuals, the opportunity to ask lots of questions, plenty of hands on involvement and a collection of interesting artifacts for us to explore. 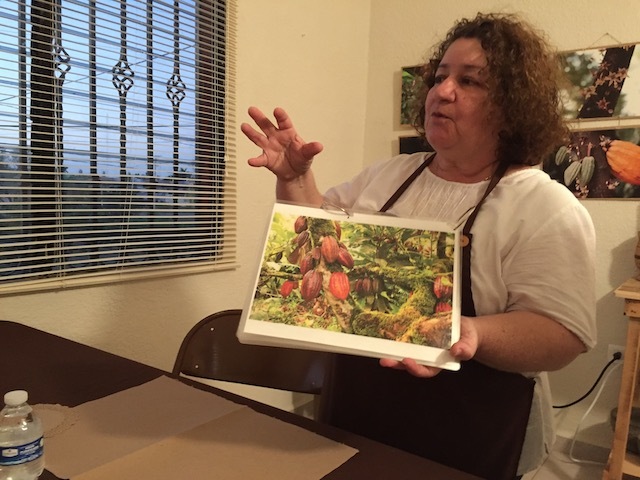 Here she is explaining that the cacao fruit grows on the trunks of trees not their branches. The colourful fruit which is actually quite tasty is harvested for its seeds which are used to make chocolate. 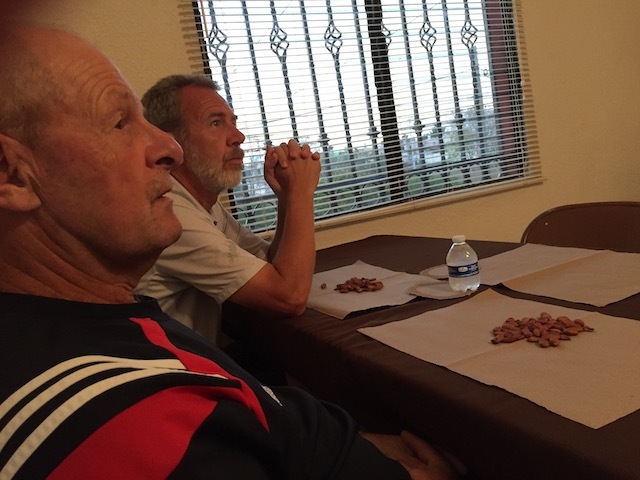 As Beatriz taught us about the cacao seeds we each had some spread out in front of us and were encouraged to experience them with our five senses. 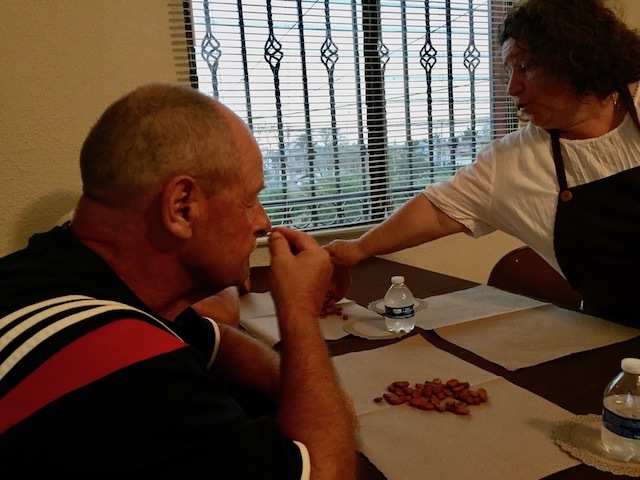 Beatriz gets her cacao seeds or beans from the Mexican state of Tabasco. Cacao is grown in the Yucatan but on farms owned by European business people. 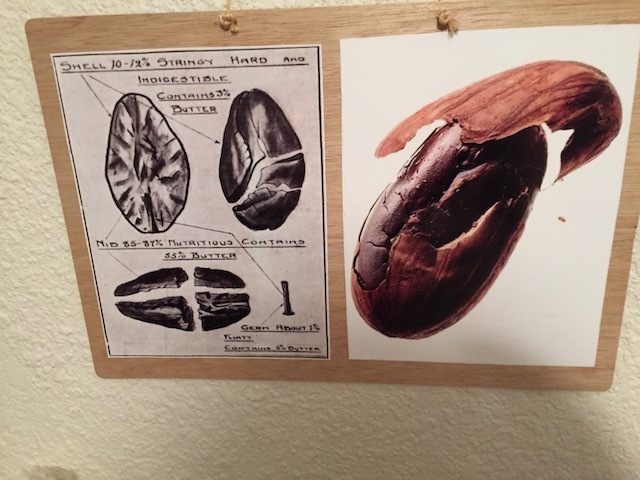 They ship the beans home to their own countries to make chocolate and don’t sell their cocao in Mexico. 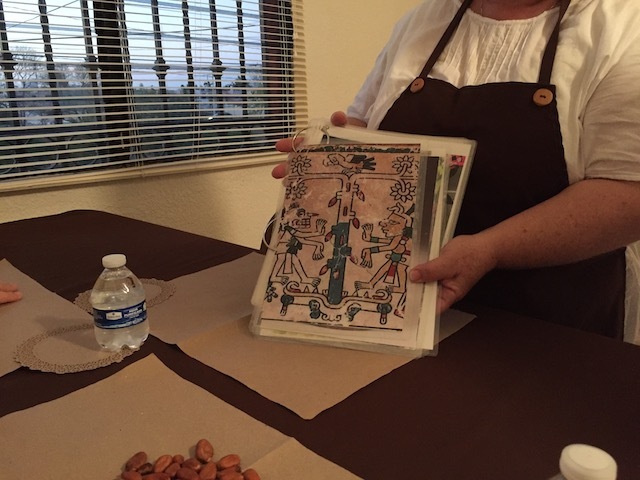 Beatriz talked to us about how important chocolate had been to the ancient Mayan inhabitants of the Yucatan. 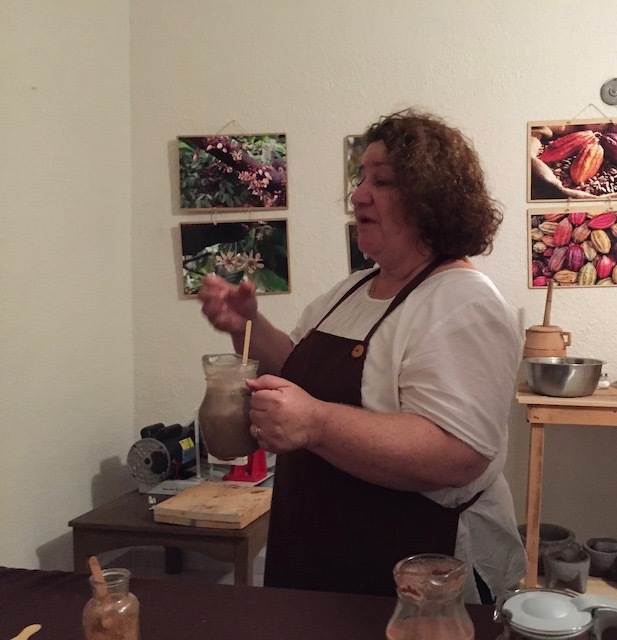 They made a drink from the cacao beans that they believed had many health benefits. 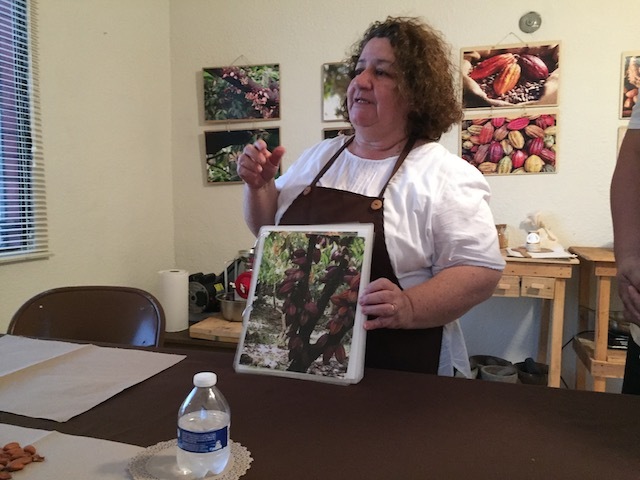 Beatriz told us the first step in the chocolate making process was roasting the beans. 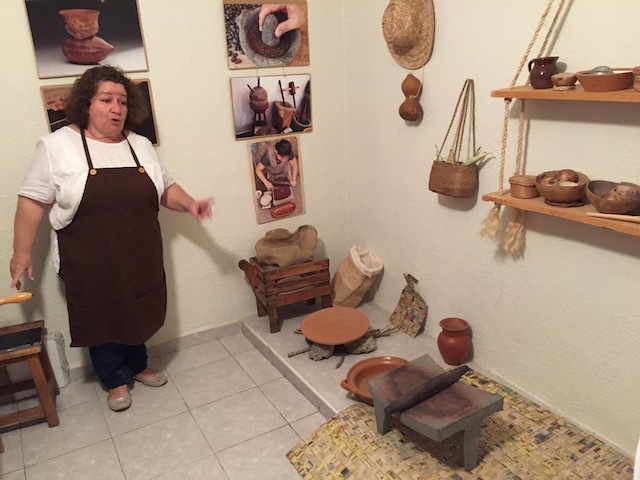 Beatriz shows us the flat stone and other artifacts Mayan women would have used to prepare beans for chocolate. Mayan women would have roasted the beans on a flat stone with a fire built underneath it. Our friend Rudy stirs the roasting beans as another workshop participant Chris who hailed from Ohio looks on. We roasted our beans however in a small pan on a hot plate. Beatriz had us keep sniffing the air as the beans roasted. The smell of the roasting chocolate changes three times and when Beatriz gets the tell tale whiff of the third aroma she knows the beans are ready. 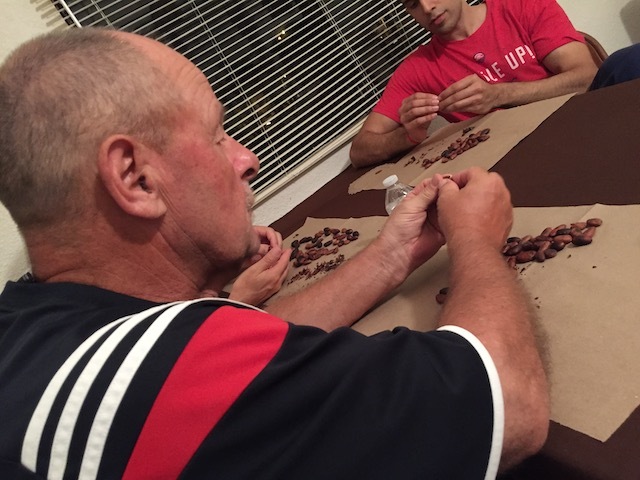 Now it was time to husk the beans and remove the outer skin. This wasn’t as easy as it looked. Beatriz asked us to save the husks because she uses them to make a delicious tea. 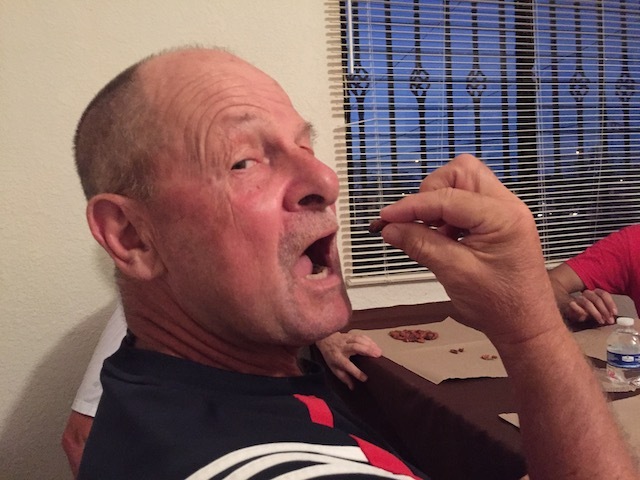 She provided a sample for us to try. There are numerous ways to make the chocolate beans into a paste. 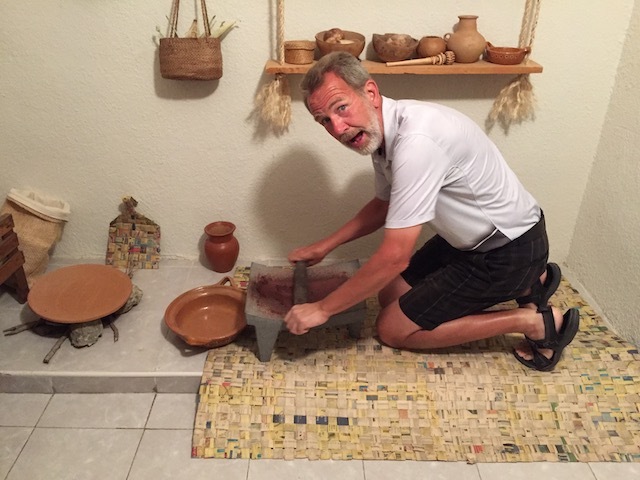 Our friend Rudy demonstrates how Mayan women would have done it long ago using a stone called a matate. 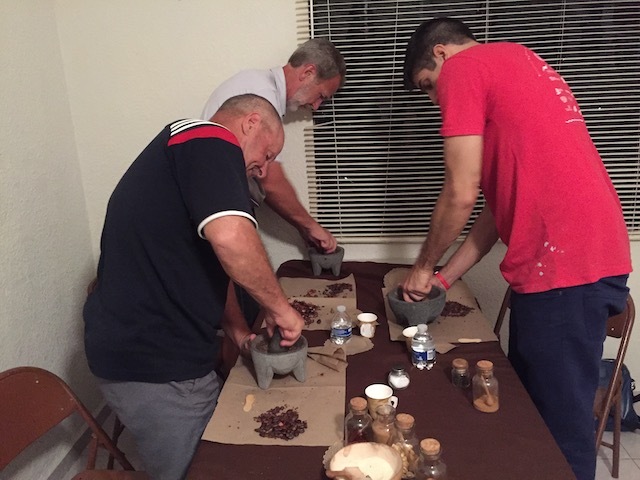 Berniz also gave us each a mortor and pestle to use as an alternate method of crushing the cocao beans into a paste. She provided cinnamon, sugar, sea salt, pepper, almonds, peanuts, and chilis as things to add to our chocolate. 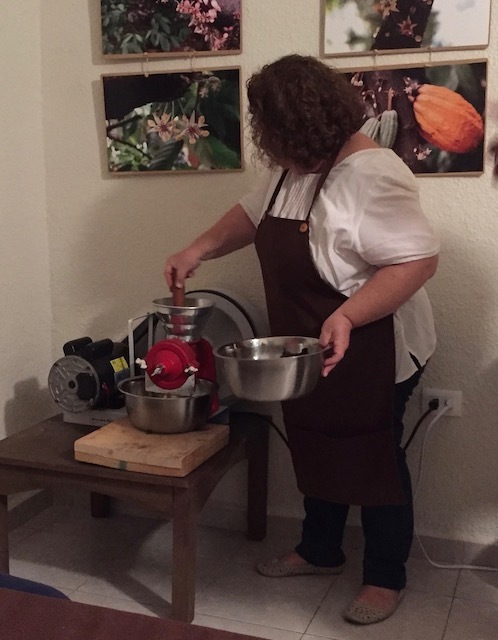 Eventually Beatriz brought out an electric blender which made quick work of creating a paste out of all of our chocolate beans. 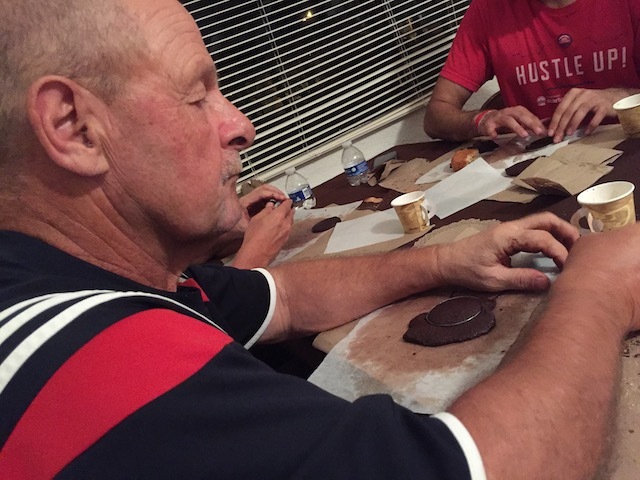 Now it was our turn to work the paste with our hands, adding sugar to taste. 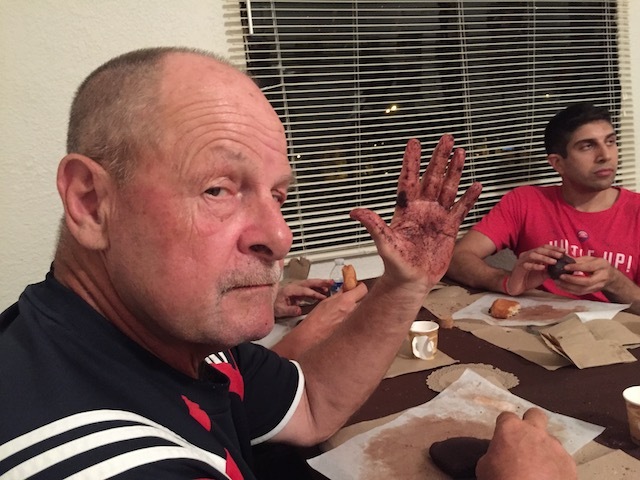 Beatriz told Dave not to worry about the chocolate on his hands. 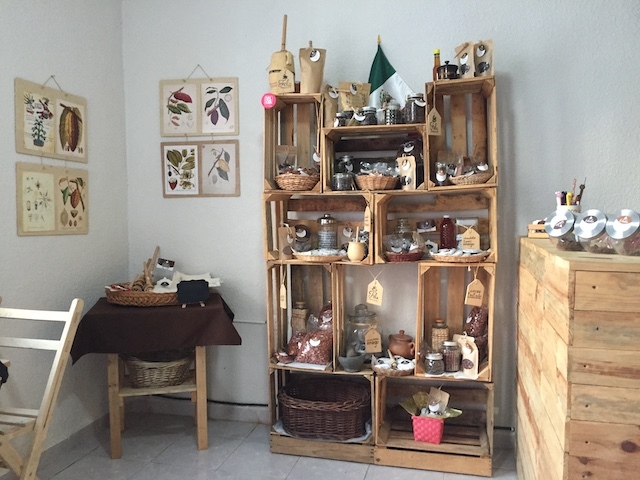 Chocolate is actually great for the skin and there are places in Merida that will give you a chocolate massage. Next we used moulds to make three or four little rounds of chocolate to take home. While we worked Beatriz served us hot chocolate and chocolate pastries. Later I bought a few chocolate samples made by Beatriz from the attractive display in the shop entrance. 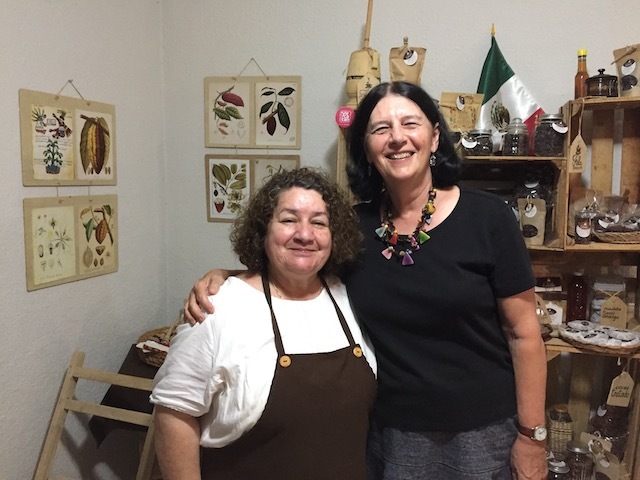 I have friends and two daughters-in-law who love chocolate and I wanted to get some of Beatriz’s products for them. 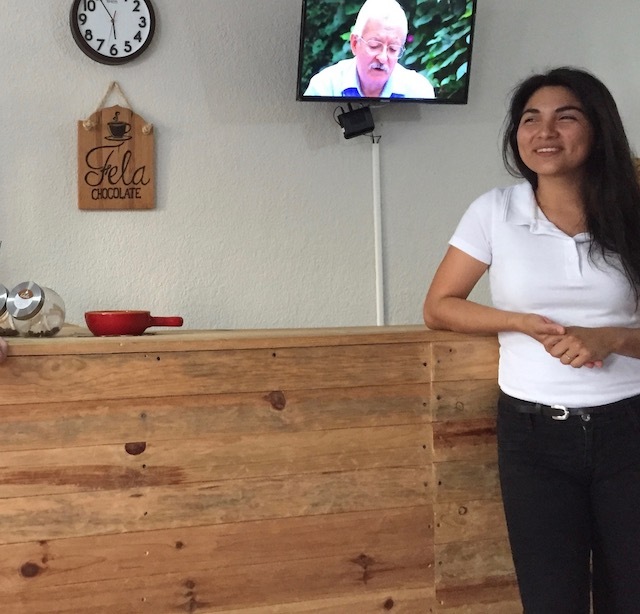 Since the official workshop was over Beatriz and I had time to chat through the interpreter about our teaching, our grandchildren, our children and some of our interests. It was lovely to get to know this enthusiastic, warm woman who has all kinds of irons in the fire to try and make life better for her family. We parted with hugs. 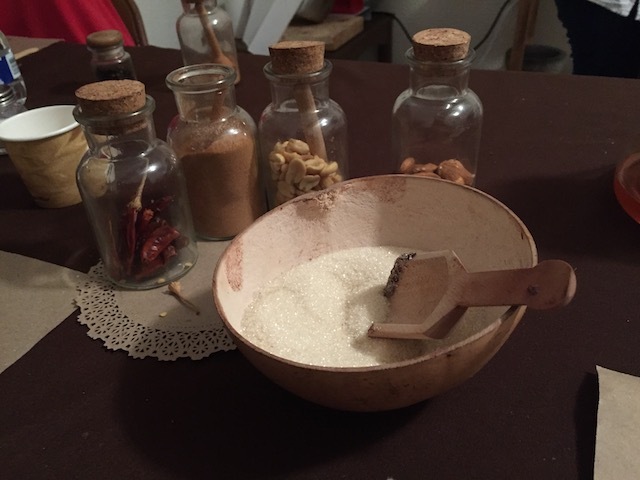 The workshop was great and I loved learning more about chocolate but the best thing about it was getting to know a grandmother in another country, who isn’t so very different than I am, and realizing how easy it can be to establish connections and cross-cultural understandings when we share our life experiences.